At Lyndoch Airfield we’re not just about helicopters! Did you know that we have a historic site, model aeroplane flying club, airstrip and recreational aviation flying school, horse trail riding and arena/venue for hire. Click on the tabs below to find out more information. CTAF: use CTAF 126.7 within 10nm and 3,000FT if over flying Lyndoch airfield, frequent traffic in close proximity. HEL scenic flight OPS 7 days per week. Model ACFT fly most weekends. Car hire available, close to Barossa Valley accommodation. Overnight aircraft parking available, 24 hour surveillance. As Barossa Horse Riding meanders through the lush green vineyards and fields you may catch a peak of any of our resident kangaroos, a herd of beef cattle usually with calves and our other horses spelling in the paddocks and if it’s a warm day we would usually find them playing in the dam. 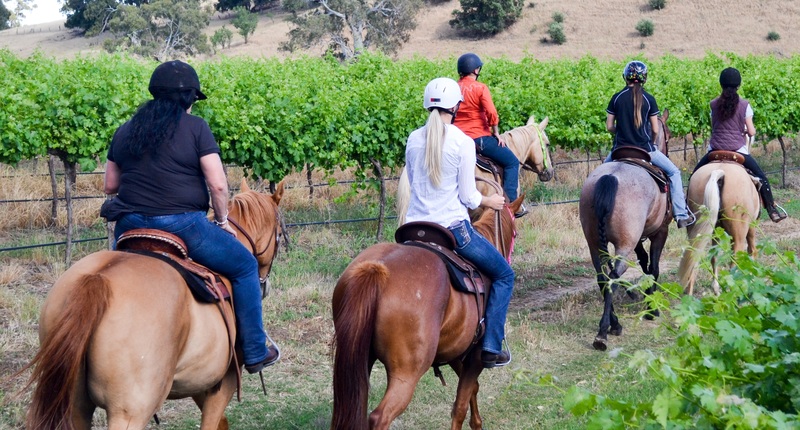 Our knowledgeable guides will share a story or two with you about the vineyards and the history of the beautiful property you are riding through. Depending on the time of the year you choose to enjoy this experience with us you will either see our vines in full bloom (summer) and possibly see them being harvested. Or if you decide to visit us in winter you may view how the vines are being pruned. We will endeavor to make your tour as personable as possible so questions are encouraged and your guide will do their utmost to accommodate each person’s needs and or requirements. Our tours are designed as a fun leisurely ride, especially for those who have always dreamed of riding their own horse through the wide-open spaces but have never been on a horse before, so please don’t be disappointed when you don’t go galloping through the paddock. NOTE: please ensure you read our terms and conditions in relation to weight restrictions and health issues BEFORE booking a ride with us. Rides start at $99 per person for 1 hour. Hoffnungsthal (Valley of Hope) is the location of a former German pioneer settlement, located in South Australia’s Barossa Valley. Founded in 1847, it was located in an ephemeral lagoon which was dry for the first years of settlement. Local Peramangk people warned the settlers that the area was prone to flooding, but this advice was ignored. In October 1853, after a week of heavy spring rains, the village was flooded and many of the houses were evacuated. After the cost of a proposed drain was seen as prohibitive, the village was eventually left deserted. Most of the settlers moved to the Barossa village of Bethanien as well as further a field. Built on higher ground, the Lutheran church was still used until 1867, when the building was also abandoned. In the local Peramangk language, Hoffnungsthal was named Yertalla-ngga (flooding land) and between the years 1917 to 1975, it was called Karawirra as part of the changes to German sounding place names during World War I. All that remains of the village today are the foundations of the church with a commemorative plaque honoring those buried in the now unmarked cemetery. Have you ever wanted to learn to fly but thought it cost too much? Well here is a cost effective way to get into aviation! Lyndoch Sport Aviation offers recreational aviation flying training in the safe 2 seat Tecnam aircraft. Our instructors have real flying experience, with our Chief instructor having 25 years of flying experience (in excess of 13,000 hrs) agricultural flying. If you want to know more about learning to fly, contact Richard on 0418 859 049. Eagle Scale Aircraft Group have been meeting nearly every weekend for about 20 years. These guys have some amazing scale models that look like the real thing when flying! If its a nice day, head on over to the Hoffnungsthal Memorial and look across the paddock to see if their cars are there. They always welcome visitors to come say hi and take a look over their aircraft.